Highlights of RFID Live: Part Two. In Part One: RFID Stars Wax I talked about the revitalization and maturing of the RFID market. Here I want to continue with specific discussions and demonstrations from RFID Live. This year retailers and suppliers have gotten re-engaged in RFID in a big way. We saw two new products developed, clearly after lots of life’s experiences in working in the high-volume consumer markets. I saw so many men’s blue jeans (and if that is the new size from American men, we need some diets)! Setting up the mock shipping docks was the in thing here, with demos from Tagsys, Impinj, Motorola and Avery Dennison, to name a few. The debate over the best method for high-volume reads at the shipping dock continues: tunnels or rack mounted readers with bigger antennas? Situational requirements may dictate the configurations you seek. 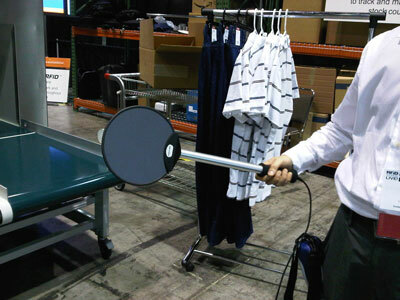 One cool product I saw here was this wand (see reader in Figure 1, above) from Tagsys. Extremely light, this is one of the first readers I have seen that small people can probably use all day and still avoid repetitive motion problems. Last year Tagsys released a great solution for private label manufacturers. Their customers’ use of this instrument continues to extend across their supply chain, from factory, through logistics, to retail store. They are gaining the value of intelligence from the software in the cloud applications, as well as an instrumented process end-to-end. Food and Pharma quality has been a big passion of ours and we continue to work with specific organizations that are putting better processes in place to lower their risks and assure consumer safety. At RFID Live we saw several great alternatives. I talked to Peter Mehring, Chief Executive Officer at Intelleflex, and got a good feel for the transformational journey the company has made. Peter was all about the solution for the customer with nary a speed and feed discussed. Refreshing. And ‘fresh’ was the discussion here, ensured by tracing and tracking the produce chain with a temperature monitoring tag (see Figure 2, at left). Although these types of technologies have been around awhile, Intelleflex seems to have gained some significant progress, engaging not just the shippers and customers, but also the logistics community (the real key to success in this type of process). Containers go Passive? Lyle Layher, MPS Plans Management Branch, Blount Island Command, U.S. Marine Corps, talked about the use of passive RFID (Omni-ID rugged passive chips) on the Maritime Prepositioning Ships. These ships carry preposition material throughout the world, and need to have supplies at the ready, as well as the capability of tracking supplies delivery and consumption. Supplies include ammunition, medical supplies and food. Past efforts have used active tags and GPS/satellite solutions for long range tracking and inventory management. The Defense Department has been a big advocate of RFID, but many suppliers worry about the costs associated with the more advanced solutions. Active RFID has its place, but passive holds the cost promises! And this case demonstrated cost and control benefits. It’s all about the data, again we say! Software solutions—beyond middleware, but real applications that support maintenance optimization in the manufacturing process, are now in operation in the Aerospace and Defense supply chains. Prominent within the A&D cluster was OATSystems (Checkpoint) with their ATA Spec2000 compliance solution. Large industry groups like ATA and AIAG (and of course GS1 and DASH7) have continued to pursue RFID standards to assure that supply chains really work and that the full value of Auto-ID is realized by all members in the supply chain—not just the big retailers or OEMs. Analog Devices in the DASH7 meeting discussed their initiative in Building Automation and Smart Energy (BASE) endeavor. Software, firmware and hardware linked together to make a variety of applications for managing home or building energy usage. Although we focus so much on auto energy consumption, I learned that 40% of the consumption of energy is in heating, cooling and lighting buildings and homes. So this is a worthy target to control the consumption and cost through automation and RFID! Analog Devices, building off of the DASH7 standard, is creating a management platform (see Figure 3, below) for just such control that will interact with standards-based devices across the building and property perimeters. We always felt that when RFID really hits big in the consumer and home markets (besides garage doors), that the market will be five to ten times what it is today. We will have to stay tuned to see if this prediction comes true in my career. Like love and marriage, horses and carriages, Tags and Software go together. Often we see acquisition go astray in many industries, but it looks like it’s working for the RFID market. The Checkpoint acquisition of OATSystems a few years ago seems to have helped both units. Here are some views from other recent marriages. By late 2010, this deal was done. I have chatted with ThingMagic a number of times subsequently, and the various units of Trimble and ThingMagic are getting on with building very robust solutions beyond the four walls. 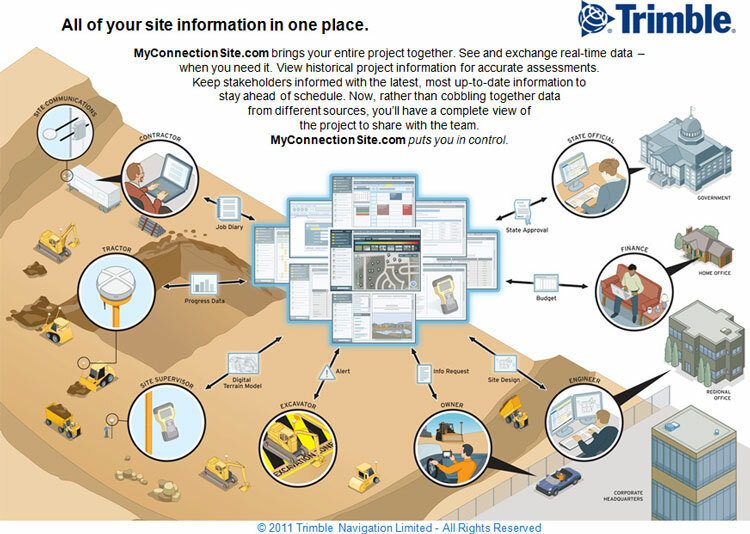 With Trimble’s leadership in GPS and ThingMagic’s in RFID, it provides a broader global, indoor-outdoor approach to visibility across many types of processes - not just supply chain, but agribusiness, construction (see Figure 4, below), emergency response, and connecting communities, in general. In short, we have a structure here that also links together the tags and the software, across many industries. Sold separately by InSync or Indentec or together, the ‘group member companies’ can work together on broader customer industry solutions. One thing that I find interesting about Identec is the full industry play—for example, they have auto manufacturing solutions, but also reach across transportation with vehicle tracking and highway systems. That is mastering an industry category, certainly from an expertise perspective. There is much more to understand about where the market is going today. ChainLink is working on our 2011 applications report. If you are a solution provider, please reach out to us for inclusion in this report.